« Bird lives worth more than military lives? WASHINGTON, Aug. 18 /PRNewswire-USNewswire/ — JunkScience.com today announced a “Save Ohio Jobs” campaign to educate Ohio voters about steep job losses that may be caused by the Waxman-Markey energy tax bill. 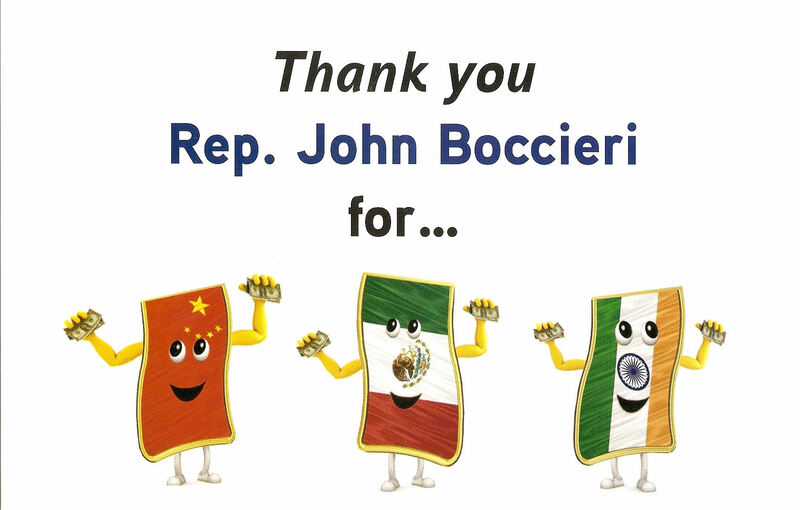 Ohio congressman who voted for Waxman-Markey and against jobs in Ohio in June include: Rep. John Boccieri (OH-16), Rep. Steve Driehaus (OH-1), Rep. Marcia Fudge (OH-11), Rep. Marcy Kaptur (OH-9), Mary Jo Kilroy (OH-15), Timothy Ryan (OH-17), Zack Space (OH-18), and Betty Sutton (OH-13). Ohio Senators who may be voting on the Waxman-Markey bill this fall include Sen. Sherrod Brown and Sen. George Voinovich. “Our on-the-ground campaign will encourage Ohio voters to express their outrage to these politicians about Waxman-Markey,” said Milloy. “Not only would Waxman-Markey send Ohio jobs overseas to places like China, India and Mexico, but the bill would force Ohioans to pay more for energy, including an almost doubling of monthly electric bills,” Milloy added. Ironically, the Waxman-Markey will accomplish nothing for the environment since, along with jobs, Ohio will simply be outsourcing its greenhouse gas emissions to China, India and Mexico. “Even if you believe in the junk science-fueled notion that manmade emissions of greenhouse gases are altering global climate, this bill doesn’t reduce emissions so much as it merely shifts them to other parts of the world — especially since China and India have vowed not to commit to binding emissions limits,” Milloy said. “A further irony is that, to the extent Waxman-Markey makes the state poorer, Ohio’s environment will suffer since environmental protection is expensive,” Milloy added. “Waxman-Markey is all pain and no gain for Ohio,” Milloy says. 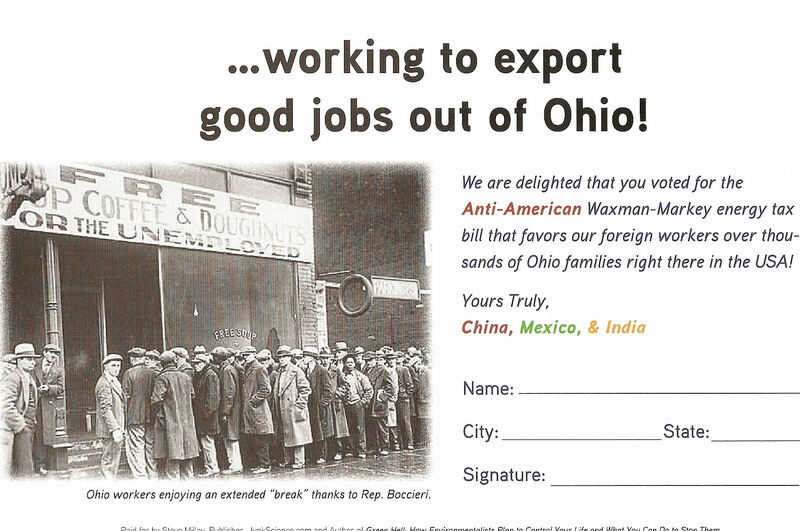 Click here for images of the postcards Ohio citizens sent to Sen. Sherrod Brown and Rep. John Boccieri. This entry was posted on	August 18, 2009 at 10:04 am	and is filed under Fighting Back. As a born and bred Ohioan I am personally thankful for Steve’s efforts on this one. Northern Ohio was once the heart of the industrial revolution. For half a century everyday goods like steel, paint, glass, tires/rubber, and more were turned out there by Americans and for Americans. Furthermore it is a state rich in oil, coal, as well as home to nuclear power. Sadly all you’ll find today are memories. The good jobs went overseas when unions got too big and greedy, then again when NAFTA made it cheaper to build in Mexico. Strip mining and coal mining have been under fire by the enviro-nuts for decades, which has in turn hurt the local companies that build the mining equipment. Yet as much harm as progressive politics have done to Ohio, the few that remember or remain are too misinformed or defeated to risk giving up a free meal for a better chance. By virtue of being big enough to be pandered to, but small enough to be naieve Ohio has been unable to get out from under the rock its been under for decades. Meanwhile the suffering that Ohioans have endured have paved the streets gold for opportunist pols.